A varistor, VDR, (voltage dependent resistor) is a type of resistor. It controls the current depending on the voltage. In these devices resistance drops sharply at a certain threshold voltage. Once the voltage across the device reaches the threshold, there is a breakdown of the electrical structure in the vicinity of the grain boundaries, which results in its electrical resistance dropping from several megohms down to a few hundred ohms. The major advantage of these is that they can dissipate a lot of energy, and they self reset–after the voltage across the device drops below the threshold, its resistance returns to being high. They can be used to protect electronics from voltages that could damage components. 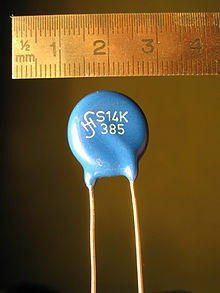 Wikimedia Commons has media related to Varistors. This page was last changed on 11 May 2016, at 15:04.